You are here: Home » GENRE » Fantasy » On Spec The Canadian Magazine Of The Fantastic #109 Vol. 29 No. 2 (magazine review). On Spec The Canadian Magazine Of The Fantastic #109 Vol. 29 No. 2 (magazine review). 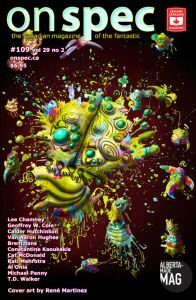 There’s some good fiction in this issue of ‘On Spec: The Canadian Magazine of the Fantastic’. ‘Sinkhole’ by Al Onia opens at Uluru, also known as Ayer’s Rock, where aborigine tourist guide Allan Balford witnesses something from the sky hit the sacred site and split it in two. The phenomenon then expands slowly and swallows more territory. Is it a black hole? This reminded me somewhat of Geoff Nelder’s story ‘Pothole’, recently reviewed but, while he went with the innocent bystanders, Al Onia tells the tale of the scientists tackling the problem. It is hinted that the answer lies in ancient tribal wisdom. You decide. The crisis was realistically handled and a few details of near future life, its set in 2026, added atmosphere and colour. When a slum is demolished, the ghost that haunts it is free to go elsewhere in ‘When They Burned My Bones’ by Lee Chamney. She tries various places but things don’t work out as planned in this humorous, agreeable tale. Averew is a lorist in ‘Spirit’s Price’ by Van Aaron Hughes. A ‘lorist’ is one who uses the spirits to heal the unwell by telling them a story, for that is their price. Regrettably, Averew’s son and presumed heir wants to use the talent to get rich but such reckless use of the power has led to disaster in the past. Dare he leave it to his daughter instead? A lovely story worthy of Peter S. Beagle and proof that fantasy doesn’t have to be all royal families, warring kingdoms and barbarians with big swords. ‘Death Is A Blindfold’ by Rati Mehrotra, this issue’s author interviewee, is about a professor and a student who witness a UFO event one night atop a mesa in New Mexico and go back there every year hoping it will happen again. She was bathed in unknown light when it happened and the consequences have become clear. It was well-handled emotionally but didn’t really work for me. As I lost a beloved hound to tumours on New Year’s Eve, I’m sensitive to canine tales and this issue closed with two. ‘Joyhound’ by Calder Hutchinson features a rare beast that uses a combination of painkillers and enzymes in its saliva to make its meal deliriously happy while being eaten. The first person narrator is invited to a party by the gangster boss she’s double-crossed and the joyhound is guest of honour. For some reason, this reminded me of Stephen King’s gangster stories which is no bad thing. In contrast, ‘Two From The Field, Two From The Mill’ by Geoffrey W. Cole takes a different view of dogs as man’s best friend. Woman’s, too, of course. Nabezhda, a professional hockey player, comes home one afternoon and finds her dog Bruno stuck to the ceiling. Then he flies out of the door and is wafted up into the sky, along with every other canine in Vancouver, Canada and the whole world. From wolves to Chihuahua’s they have all ascended. Aliens? Rapture? Millions of distressed owners cope with the disaster in a variety of ways, including religion. This was highly entertaining, completely mad and not quite credible. I can believe people going this crazy in the USA but not in Canada. I mean, they’re practically British. But you never know. One day they may bring in laws against Un-Canadian activities, and surely not buying ‘On Spec’ will count as such a crime. It’s definitely worth a look, especially for locals. « Crimewave Eleven: Ghosts (Crimewave Short Story Collections) (e-book review).